This page gives information about the platform Grannies International or as it is called on Facebook „Grannies against the right wing parties in europe“. Our aim is to connect to older women and grannies all over the world who share our opinions and resistance concerning the right wing and extremists movements world wide. Being Old does not mean being silent! 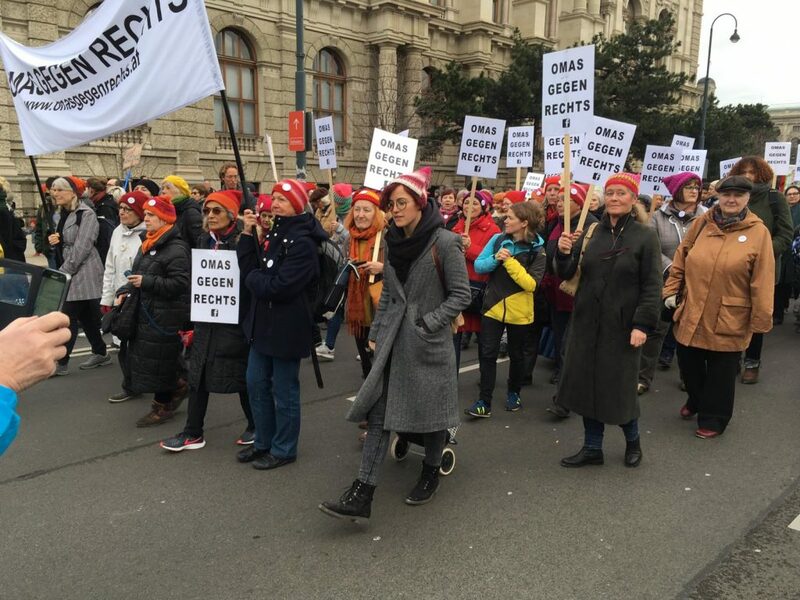 Grannies against the right wing parties in Europe Is a civil rights initiative which was founded as a facebook group on the 16th November 2017 in Vienna. Our aim is to influence the political discourse by having older women , so-called “grandmas” raise their voices about the political issues which are threatening us throughout Europe today. You don’t have to be a grandmother to join! Anyone of any age can become a member, women, men, young and old, we all together! Our main topics are the maintenance of parliamentary democracy in an undivided Europe, commitment to the equal rights of all women, men and children living in Europe, maintaining the social standards, which were bitterly fought for by our parents and grandparents and the respect due to all our fellow citizens regardless of religion or ethnicity. At the same time, we recognize the threatening developments such as anti-Semitism, racism, misogyny and fascism. They must be named and we must build a political resistance against them. The elderly woman as a public political force does not exist in our collective consciousness. That’s why we women have to appear in public, not as individuals and exceptional figures, not as stars, but as a group that stands out. Stepping out of one’s own „small world“ and forming a united strong voice for the future of all children and grandchildren is the challenge of the hour! Because maybe one day they will ask us: what did you do? Unlike many of our politicians we are very aware of our responsibility towards the youth. We are ready to resist the impending social cuts, the „starvation“ of many older women, a short-sighted educational policy which excludes large groups of youth, and other plans which would have a disastrous effect on our society and our wellbeing. We do not have any small children anymore. Nor do we have a full working life. And this gives us more time to involve ourselves politically. Right now it seems the most essential thing to do! 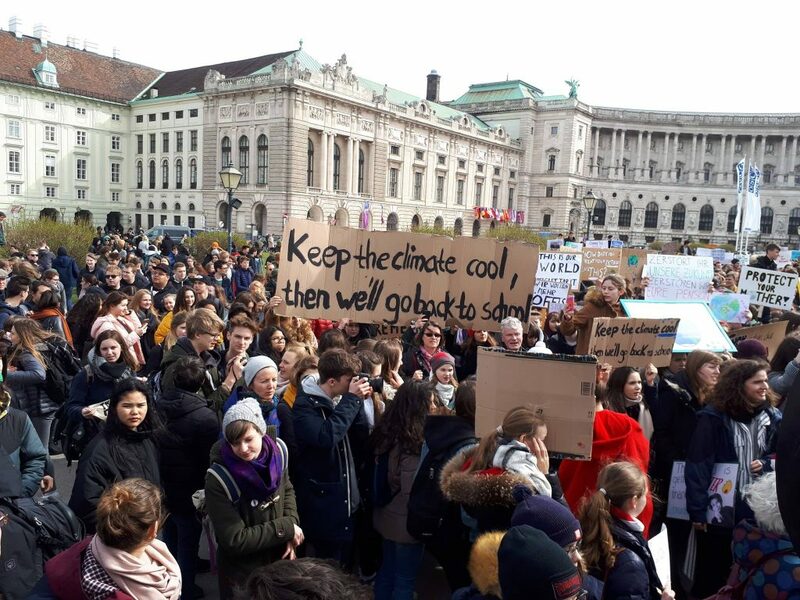 Grannies international support the world wide climate strike and march on the side of the young, the school kids and students to support a policy change for reducing climate threats. OMAS AGAINST the RIGHT was founded in November 2017 by Monika Salzer in Vienna in response to political developments in Europe in general and in Austria in particular, and was constituted as an association in April 2018. OMAS AGAINST the RIGHT is a non-party, civil society platform for the defence of democracy, the social state and the rule of law. OMAS AGAINST the RIGHT maintains absolute equidistance to all political parties. This also means that party political activities in the name of OMAS AGAINST the RIGHT and as OMAS AGAINST the RIGHT are incompatible with the aims of this platform. Whoever stands up for a political party – no matter whether on a municipal, regional or national level – cannot speak for OMAS AGAINST the RIGHT at the same time. Whoever campaigns for a political party cannot do so in the name of OMAS AGAINST the RIGHT or as GRANNIES AGAINST the RIGHT.